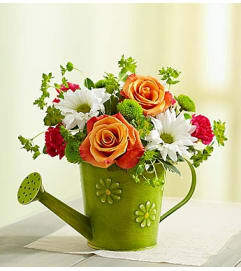 Wherever they’re from, this bright and beautiful arrangement brings the charm of a country garden into their home. 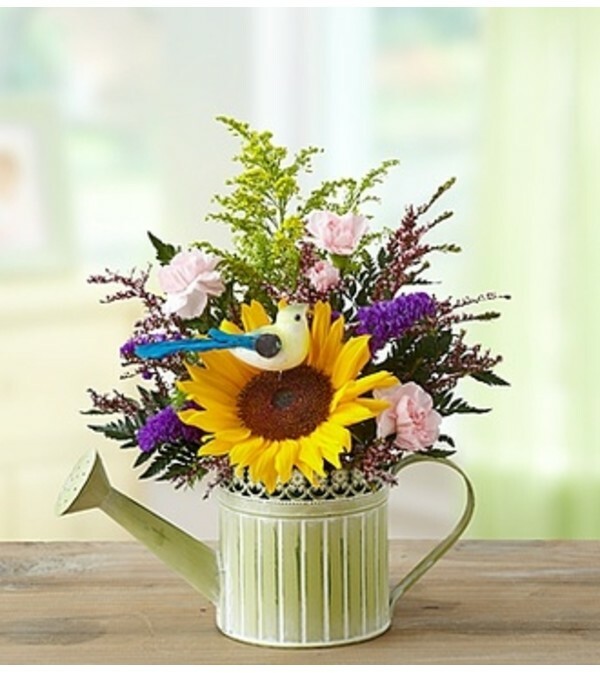 Tucked inside a keepsake decorative watering can, our florists gather a stylized bouquet of bright sunflowers, spray roses or mini carnations, calcynia and more, with a pair of bird picks to complete the vision of nature at its most beautiful. Artistic arrangement of sunflowers, spray roses or mini carnations, calcynia, statice, solidago, leather leaf and foxtail. Hand-designed in a vintage green watering can with removable spout; watering can is for decorative use only and measures 4.5"H. Accented with playful bird picks. 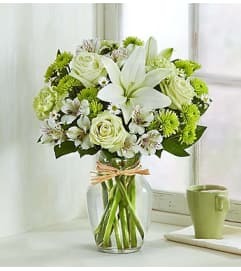 Small arrangement does not include spray roses.